Today we have guest blogger and Illustoria contributor Lindsay Stripling, one of our absolutely favorite local artists, sharing with us her thoughts on shopping locally and the artists in the San Francisco Bay Area whom she loves to support. We couldn't agree more with her choices and hope you get inspired to shop local wherever you are. The shop local movement started as a way to support the local economies during the recession in 2008 and after, but the current shop local movement has transformed into a way to support local businesses and artists during a time when perhaps they are struggling to keep up with rising rent prices due to the local economic boom. There is no time like the present to support the shop around the corner or the artist you see every morning on a walk- every little bit counts and it helps to create the type of environment we wish to live within. I took a little time to map out a few creatives who are excellent and whom I will most definitely be gifting from this year and are perfect last minute holiday gifting ideas or a way to celebrate a new year! Maria Shoettler’s work is so fresh and loose and documents local flowers, veggies and basically the Bay Area environment in a way that honors the land that they’ve come from. Her 2017 calendar has a recipe for each month with her beautiful watercolor illustrations showing the seasonal veggies and fruits that would honor each recipe. She is as thoughtful as she is creative and I cannot wait to give my niece her new coloring book depicting local wildflowers. Grace Levine is the genius behind Kitty Hawk Gallery, an adorable boutique and art gallery in Sebastapol. Grace always has time for a fun chat and a good back story on each of the items in her shop. If you do not have time to visit her in person, she has an incredible online shop and is able to honor over the phone orders. Her paintings are whimsical and sarcastic and make me laugh every time. She has her own artwork as well as that of other artists, clothing, jewelry and other goods made by talented local and national craftsmen and women. Definitely a good place to take a day with the fam to get some lunch at one of the cool little breweries and wander around downtown Sebastapol. Case for Making is an art supply store like you’ve never seen in the Outer Sunset of San Francisco next to the beach and the park. Alexis Petty who owns the shop designed the space and stocked items around the idea of what artists actually love using and experimenting with. All of the items stocked in shop are things that the working artists who staff the space actually use and love. Alexis is an artist herself and loves process and exploration and she has framed her store with the idea that you everyone has the ability to be creative. Alexis’ newest endeavor with Case is that she now make her own CFM watercolors from scratch! You can gift a set of locally handmade gorgeous watercolors- with colors like Ultramarine Blue, Florescent Red, and Sahara Ochre- you can choose what colors make up your set. There is something for everyone at Case, whether you are an experienced artist or someone who hasn’t ever created before and especially for kiddos, there is something to explore and feel empowered by. Grab some lunch up the street with the fam at Outerlands and then grab some supplies for a creative afternoon at Case. I first saw Illustoria Magazine when I was working on a Saturday morning at Case for Making. As a kid I grew up loving Highlights Magazine, where there were activities and articles that entertained me for weeks. Illustoria is totally a nod to old Highlights while also being for kids’ grown up counterparts! It's insane how Joanne Chan, the founder and editor-in-cheif of Illustoria, and Elizabeth Haidle, the creative director, have both created a magazine that is challenging and fun for both kids and adults. They have cram packed it with illustrations from talented artists from all over, made it informative and creative with projects, coloring sheets and articles from different creative people. I will say as a kid I had no idea that I could actually be a creative person as a grown up for a living, only because I never saw examples of adults I knew doing that, but had I grown up with Illustoria I would have had a completely different understanding of what my adult life could become. I already gifted subscriptions to kids in my life and I look forward to seeing what else they come up with! Jen Garrido is a San Francisco Bay artist who works with oils, acrylics and watercolors. 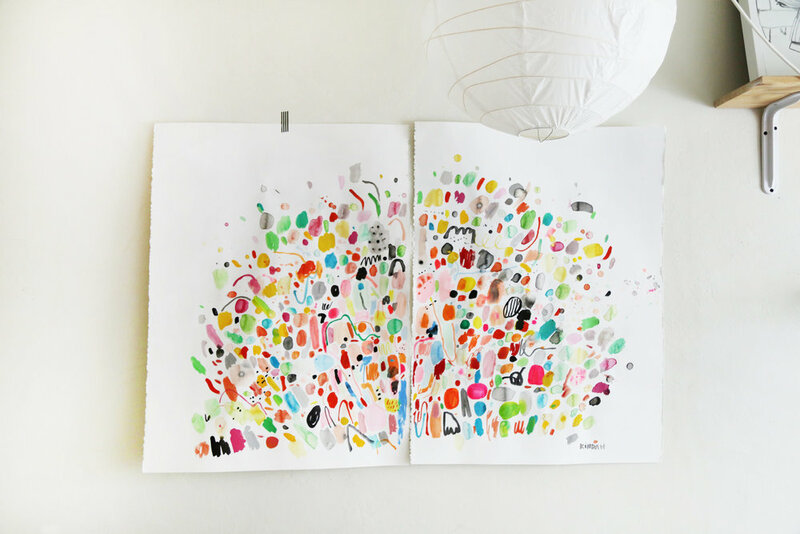 She does incredible, loose and colorful florals on paper and panels that she always has for sale on her website. Jen has an alter ego, when she isn’t painting, she is designing textiles for her home wear company Jenny Pennywood that she has printed locally items like tea towels, pillows and textiles. Jen’s patterns and paintings are fun for everyone in the family and are a perfect gift idea. You can find them in person along with all sorts of other equally beautiful items at the General Store, right next door to previously mentioned Case for Making in the outer sunset. Kindah Khalidy is a local oakland based painter that is just an explosion of color. I have been dreaming of getting one of her large paintings to hang in our bedroom. Her paintings are vibrant, playful and very very beautiful, she also makes them into small makeup bags, beautiful shirts and other fun items that you can find in her webshop. She will even make prints of any painting that you like for a more affordable option if an original isn’t in the cards this year. And finally if you are looking for a place to visit with the kiddos, a morning or afternoon trip to get everyone out of the house during this holiday season- take a short trip down the coast to Yonder Shop in Pacifica. Linda Fahey is the amazing ceramicist behind this space, she has turned her studio into a small boutique. When you visit Yonder you can see her work in process as well as shop finished mugs and bowls of hers and beautiful paintings, textiles and apothecary goods of other makers whom she has curated in her shop. Linda is a great host, has lived in Pacifica all her life and visiting Yonder is like stopping by a friends house. After you get some goodies I would wander down to Linda Mar beach and let the kids run around while you watch some surfers and look for whales. Lindsay Stripling is a San Francisco based artist who lives and works in a neighborhood located right next to Golden Gate park which runs for miles, due west, straight to the Pacific. Lindsay works primarily with watercolor on paper, using color and form to create dreamlike narratives that echo folk and fairy tales that we vaguely remember from childhood, where the moral might be lost, switched, blurred or even just completely missing. Lindsay’s illustrations have shown up in Illustoria and she is currently working on a fun coloring book for both kids and adults. You can learn more about Lindsay and her gorgeous work and support her here.